Earlier this week, Warner Bros. held a special theatrical event for their highly-anticipated animated film Batman: Return of the Caped Crusaders, which reunites original Batman TV series stars Adam West and Burt Ward. During this two-night event, the studio reportedly handed out surveys to moviegoers in select theaters, to gauge their response for future animated movie projects. One of these mentioned in the survey will certainly get some fans very excited, a crossover of Batman and Teenage Mutant Ninja Turtles. A source for We Got This Covered attended one of these screenings, and was given this survey. 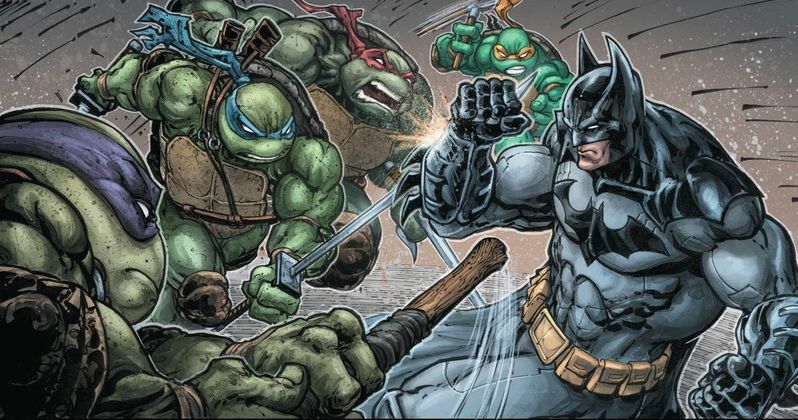 One of the potential movies listed was a Batman and Ninja Turtles crossover project, which would most likely be an adaptation of a recent comic book crossover. Last year, DC Comics and IDW teamed up for a six-issue monthly mini-series, where both the comic book versions of Batman and the turtles meet up. There is also an ongoing comic launching next month, which features a unique twist. This series will follow Batman from the 1990s hit show Batman: The Animated Series, who will meet the Heroes in a Half Shell from their current animated series on Nickelodeon. This survey didn't specify any details about this Batman and TMNT crossover, or if it was in active development at the studio. Other animated movies listed on the survey included a team-up of the original Batman '66 stars Adam West and Burt Ward with the original Wonder Woman '77 TV series, which would likely bring back Lynda Carter to voice Diana Prince. This report reveals that DC has already revived both the Batman '66 and Wonder Woman '77 with new comic books as of late, and there is a comic book crossover of both properties already in the works as well. Again, no details have been given about this project, but it's seemingly one the studio is considering. There was also mention of a solo Swamp Thing movie on this survey handed out to movie patrons. There had been talk that Swamp Thing would be part of the Justice League Dark movie. It isn't confirmed yet if Batman and Teenage Mutant Ninja Turtles crossover, or any of these other projects will happen, but if the random moviegoers given this survey expressed their excitement about these projects, it's certainly possible they will move forward if there is enough buzz.